Saturday night, Alex Ovechkin finally played in his first Stanley Cup Final game on home ice and it didn't take long for him to put his stamp on the game. In the 2nd period, Ovechkin opened the scoring with his 14th goal of the postseason, but that wasn't the moment of the period that went viral. Instead, the moment that fans were talking about was Ovi reacting to Evgeny Kuznetsov's goal to make it 2-0 and it was marvellous. Can you tell how badly Ovechkin wants to win his first Stanley Cup? With reactions like that (and this one from Game 2), it's basically impossible not to cheer him on at this point. 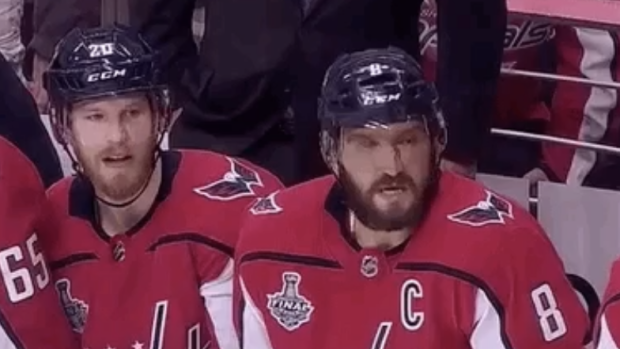 Based on these in-game reactions, we can only imagine what Ovi's reaction would be to finally winning the Cup. If the Capitals hold on in Game 3, though, we'll be two games closer to not having to imagine that moment.